Whether it be a Birthday, Christmas, Valentine’s Day or a simple Wedding gift American Retail Supply has a huge variety of Gift Wraps. Even the smallest occasions like a farewell gift needs to be marked with a thoughtful gift and equally eye-catching gift wrap. Let us help you make the outside of the gift as special as the inside. We have a collection of patterns, that includes Double Sided gift wrap, Everyday gift wrap, or Western Gift Wrap. Double Sided gift wrap is very convenient, it’s like getting two gift wraps for the price of one. Everyday gift wrap is for all occasions. Western themed store will really like Western Gift Wrap. If you are browsing for more specific gendered gift wrap, then our Feminine & Masculine Gift Wrap Collection will be superb. Every present deserves a chance at a great first impression. Providing a gift-wrapping service is one of the best ways to have customers remember your extraordinary customer service. When purchasing gift wrap, think about your overall usage. We have a variety of sizes to choose from. Full Reams are 833’, Half Reams are 417’, Quarter reams of 208’, or a Cutter Box of 100’ per roll. 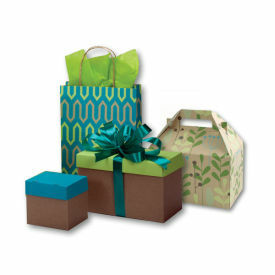 Once you have chosen your size, we have over 2000+ gift wrap designs to choose from. At American Retail Supply, we want to make sure you can get all your gift-wrapping supplies in one place. That means having over 350+ Gift Ribbon options. Ribbon is the ideal finishing touch for many projects; ranging from beautifully wrapped presents, gift baskets, DIY crafts and even decorations. Gift Ribbon comes in a variety of colors, patterns and materials to match any occasion you are celebrating. If you are interested in a more rustic look, try using a Natural Ribbon. If you are desire a high-end look, try using a Satin Ribbon. Tulle Ribbon is a great option for decorations at any event or making those popular DIY tutus. Curling Ribbon is one of the most popular options for ribbon. This economical option comes in two widths and a spectrum of colors. Natural & Synthetic Wraphia (type of gift ribbon) are available in matte & pearlized options. This ribbon is great if you are looking for something a little different. Grosgrain Ribbon has a ribbed texture and appearance. Tie any ribbon onto the handle of a shopping bag and turn the shopping bag into a present. Gift Bows are a fast and easy way to add a fishing touch to any present. A contrasting color or sparkly bow can really make your gift wrap pop. Gift Bows lets your receipts know that you took the extra time and thoughtfulness into the present. It’s not always about what is inside the present that matters. Gift bows are used at wedding shower to create bouquet, which the bride saves as a cherished memory. We have many different styles of gift bows. Here are few examples of Gift Bows. Perfect Bows is easy as pulling a string of ribbon. It magically makes a professional looking gift bow finish the gift bow by curling the remaining two strands of the perfect gift bow. Similar to the Perfect Gift Bow, Pre-Notch Gift Bows come flat as well and all you do is fan the loops apart to make a beautiful bow. Finally, Star Bows the most common and the easiest because you will simply peel and stick to your present. If you don’t see exactly what you need or interested in placing business logo on Gift Wrap, Gift Ribbon or Gift Bows, call us at American Retail Supply1-800-426-5708to speak to one of our Product Experts.